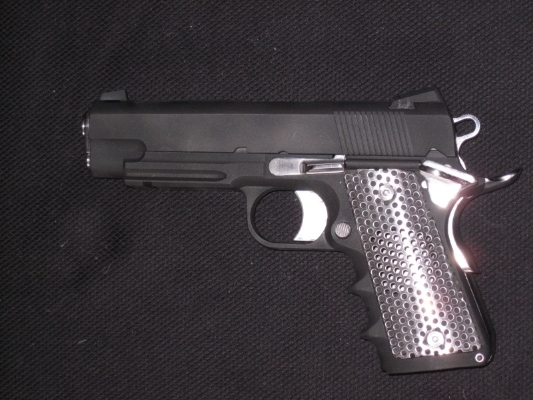 My concealed-carry concept gun…looking forward to bringing it to you. A couple weeks back I posted a video on Facebook of the mill cutting out some molds meant to help make some neat 1911 grips. Way back in 2011 I made a set of these for an experimental project gun that incorporated a bunch of different ideas I had for the ideal (in my conception) concealed-carry piece. The grips I made were hand-formed over a piece of pipe, and put on a frame that was so customized that nothing else would fit anyway, but I like how they looked, and more importantly, they had a nice balance between texture when shooting and smoothness when carried IWB. So I decided to make them and sell them. In 2013 I left my job to found Leo Combat, and the first thing I did was throw a website up and offer people a chance to preorder grips at a discount. I had already lined up some sheet-metal guys to help me with manufacturing, and I ran a few ads to try to gin up interest. OK. Well, I’m glad I didn’t take their money, I just let them put themselves on a list. But I tried to keep moving forward, talking to a marketing guy about what I was doing wrong and talking to folks at gun shows. One key thing that I heard was the worry that perforated metal grips would let dirt into the internals of a 1911, or that the metal would scratch the paint. I figured I could solve both problems at once by putting a plastic liner under the grips. So I spent quite a bit of money to have CAD drawings made of both the sheet metal and the plastic liner, and started looking at how to get both made. At this point, my original sheet metal shop stopped calling me back, so I went looking for another. And what I found was that the original estimate of the price of forming dies was off–by a factor of 6! Which explains why the original guys stopped calling once they figured out what they had promised. It got worse from there…the price of an injection mold to make the plastic liner was even higher than the forming dies. My business budget was too small to have even a single pair manufactured–and this was the same budget that launched 3 other products! So I shifted my focus to less-expensive ideas, but felt bad about letting down the people who wanted grips, and a little sad that my first idea wasn’t going to happen. And I kept thinking about how to make it happen for less.